A sales invoice is a document issued by a seller to a buyer. It may also be known as a purchase invoice or commercial invoice. The invoice is a record that details what has been ordered, the date it was despatched and the amount of money owed. Some invoices may be more detailed than that and could include payment terms or other order-specific information. You’ll find a wide variation in sales invoice templates because there are so many different uses for them. There is no ‘one-size-fits-all’ rule for how they should look and the information they should include. Not only can invoices differ based on the company, but you can also expect differences depending on the industry you’re in and sometimes even the country. Because business is so global these days, it’s good practice to make sure you include all applicable information if you’re dealing with clients in a foreign country and billing in a different currency. VAT Invoice. If you routinely deal with firms in Europe, you’ll need VAT invoice that contain a field for a VAT (Value Added Tax) identification number, which is used by international companies instead of the retail sales tax common to U.S. businesses. Purchase Invoice. This is the same thing as a sales invoice, and the phrase used usually depends on which end of the transaction the user is on. The buyer may call it a purchase invoice since he or she is the one making a purchase, whereas the seller may refer to it as as sales invoice. Credit Note. Also known as a credit memo, a credit note is issued by a seller to a buyer to detail that a specific amount has been credited to the buyer’s account, often due to correcting a mistake. It may be considered the opposite of a sales invoice. Proforma Invoice. This document is a preliminary bill documenting the commitment of a seller to deliver goods for a specific price. Because the product hasn’t yet changed hands, a proforma invoice, also known as a sales order, isn’t a true invoice or official receipt. Commercial invoices will often contain much of the same fields and information that you’ll find on a general invoice template, such as date, invoice number, payment methods and payment terms. Depending on how detailed your records are required to be, you might need to use tax invoice templates that include fields for tax payments, the tax rate and/or tax breakdown. It’s a legal requirement for any business to keep accurate accounting records of everything from tax payments to merchandise numbers. Using templates for invoices allows you to fulfil this requirement quickly and easily, saving you money. As well as that, they allow you to keep track of payments coming in – and when they’re due – and goods going out. Templates also help companies present an organized, professional appearance when dealing with customers. Instead of trying to come up with an invoice form on your own, select one of the pre-designed sale invoice templates below. They are free to download and you can easily choose a simple or more detailed option that best suits your business needs. 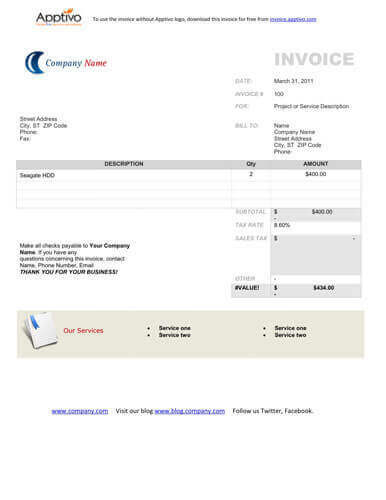 This free simple invoice template shows company info, billing and shipping address, description, amount. It automatically calculates subtotal, tax rate, sales tax and tax. You can edit and customize this template with Microsoft Excel to fit you needs. A simple invoice which calculates a sales tax and total. Very basic design, green color theme. By default, this template only supports Landscape orientation. This free simple invoice template shows company info, description, quantity, sales price, amount, tax. It automatically calculates subtotal, shipping charges and tax. You can edit and customize this template with Microsoft Excel to fit you needs. Once you input the required information, such as unit price and number of items, this spreadsheet will automatically calculate the subtotal and taxes. Customize this template with your logo so that clients can easily identify who they're doing business with. Free invoice format download in xlt format for your business. It is free to download, edit, email, and print. 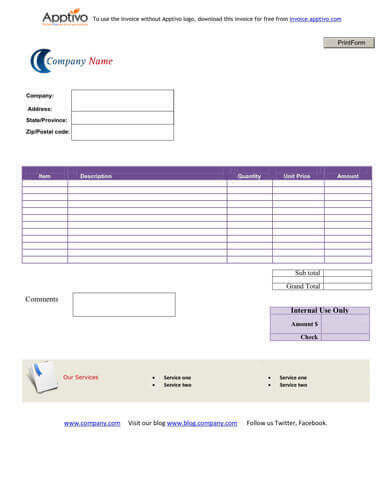 This template can be used for most types of businesses and billing; it has place to add your logo and company address, data, invoice number, and a table for products or services. This is a typical Purchase invoice. It has space for contact info of both seller and buyer, slogan and the company's name, invoice number, customer ID, document title, shipping information, P.O. number, terms of sales, and a table for detailed list of products with unit description, price, quantity, and total amount owed. Sales tax and shipping charges can be added to subtotal. Very simple Microsoft Word template with standard fields. 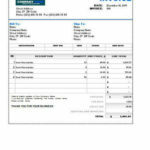 The invoice includes fields for description, taxed or not, amount column. Included are subtotal, taxable, tax rate, tax due, other, and total. Feel free to add your company logo and information. 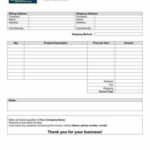 This free simple invoice template shows company info, description, unit price, sales tax, shipping and total. You can edit and customize this template with Microsoft Word to fit you needs. There is an image of an invoice in the background. 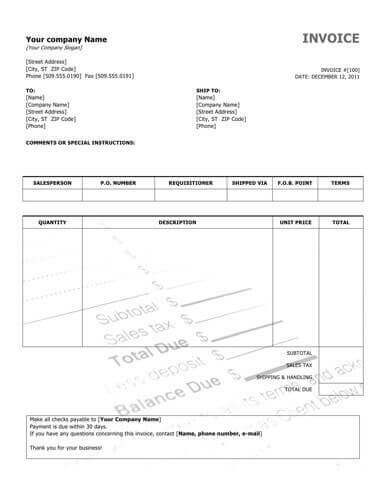 This Blank Invoice Template can be used by any company who manufacturers and ships products. The invoice includes the following information: invoice number, invoice date, company information (name, logo, slogan, complete address and telephone numbers), invoice shipping info table with 6 columns (Sales rep, P.O. number, Ship Date, Ship Via, FOB, Terms) and main invoice table with 4 columns (Quantity, Description, Unit price, and Total). The template is best suited for businesses that manufacture, sell, and ship tangible products that can be paid by check. Remittance slip at the bottom can be detached and sent along with check. Very simple sales invoice template featuring company info, shipping and billing info, payment conditions and remittance slip. Easy to edit with Microsoft Office Word. This invoice does not include buyer's information, and thus perfect for businesses who conduct cash transactions. The invoice is quite simple and includes item number, item description, quantity, item price, and the invoice total. 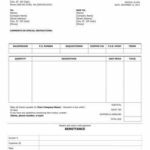 This free simple invoice template shows company info, description, unit price, sales tax, shipping and total. You can edit and customize this template with Microsoft Word to fit you needs. This black header Sales Invoice template is a nicely designed template that is applicable to all types of businesses. Transaction information is inside of a table with six columns: quantity, description, unit price, and total. Another table provides space for additional information: Sales Person, Invoice Number, P.O number, Shipped via, FOB points, and Terms of service. 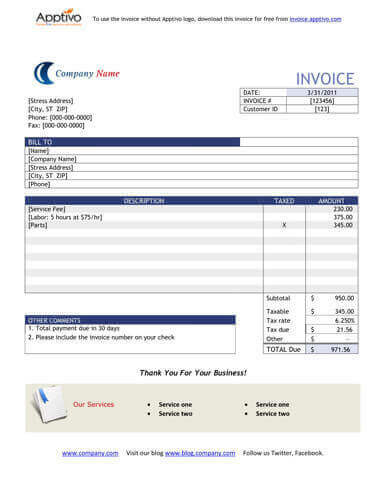 Blank invoice with banded rows design and a marketing banner to promote company's products or services. Top table displays	Sales person, P.O number, Requisitioner, Shipped via, F.O.B points and Terms. Bottom table is for transaction details and it displays Quantity of the items sold, Unit Description, Unit price, and Total. Sales Tax and Shipping Charges can be added to Subtotal. Simple Service invoice for any type of business. Transaction table displays Item, Description, Quantity, Unit price, and Amount. There is a small table for internal use with place to record payments made by cash or check. Simple Sales invoice to sell spare parts. Includes table for transaction details, and a markting banner in the footer to advertise company's products and services. 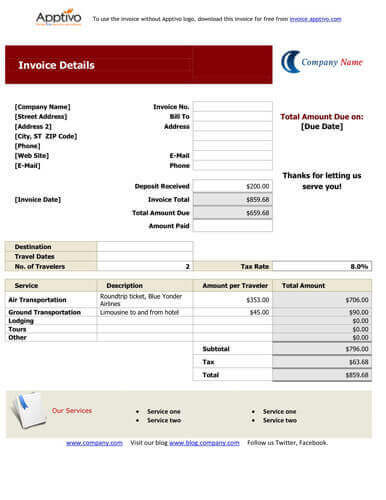 Fully editable Microsoft Word Invoice Template. 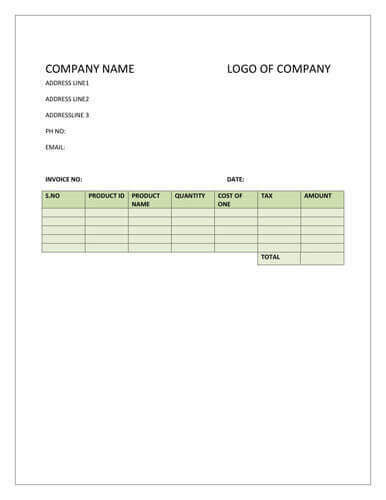 The template is made of the following fields and components: Company logo, Document heading, Date, Invoice number, For and Bill To, company address, Table with description, quality, amount, subtotal, sales, tax, tax rate, total, Text field for payment terms and other info, Banner to promote your company and products, and a Text footer. Sales invoice for company who manufactures and ships products. Green gradient design with logo, advertising banner, and a footer section. Standard Purchase Invoice with standard information (buyer and seller contact info, transaction table). Advertising banner at the bottom of the template can be used to promote news, products, or services. This is a simple invoice that can be used by any store which sells different types of products it also helps to track customer details. This template is is designed for companies who sells products and can be used by any type of businesses operating in the manufacturing domain. 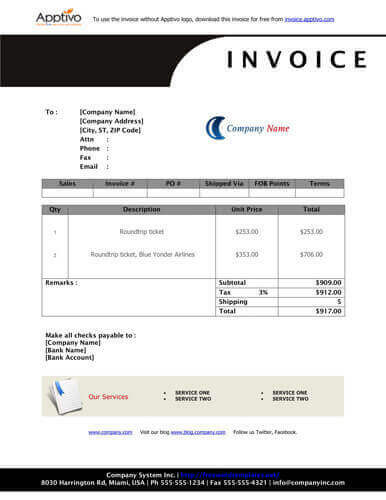 This is a professional invoice template for any travel agency. There are columns for services, description, amount per traveler, and total amount. Amounts are highlighted in another color for your convenience. Included at the bottom are sales tax, and total. The invoice is made of two tables. The first consists of the salesperson’s name, job, and payment terms which are usually due on receipt and due date, when the products have to be delivered. The other table contains the quantity of the products with the description and amount respectively. This invoice is for a travel agency. Each invoice line can be filled with details such as the travel cost, service, description, amount per traveler, and total amount.